Today we are releasing Windows 10 Insider Preview Build 10576 to Windows Insiders in the Fast ring. Not only does this build have a good set of bug fixes and fit-an-finish, it also includes a few new things for you to try. Cast a video from YouTube: Go to YouTube.com in Microsoft Edge. Click on the "…" menu and the top left, and select "Cast media to device" and select the Miracast or DLNA device you want to cast to. Cast a Facebook photo album: Login to Facebook in Microsoft Edge and click on the first photo in one of your photo albums to cast. Click on the "…" menu and the top left, and select "Cast media to device" and select the Miracast or DLNA device you want to cast to. Navigate through your photo album by clicking on the forward and backward buttons. 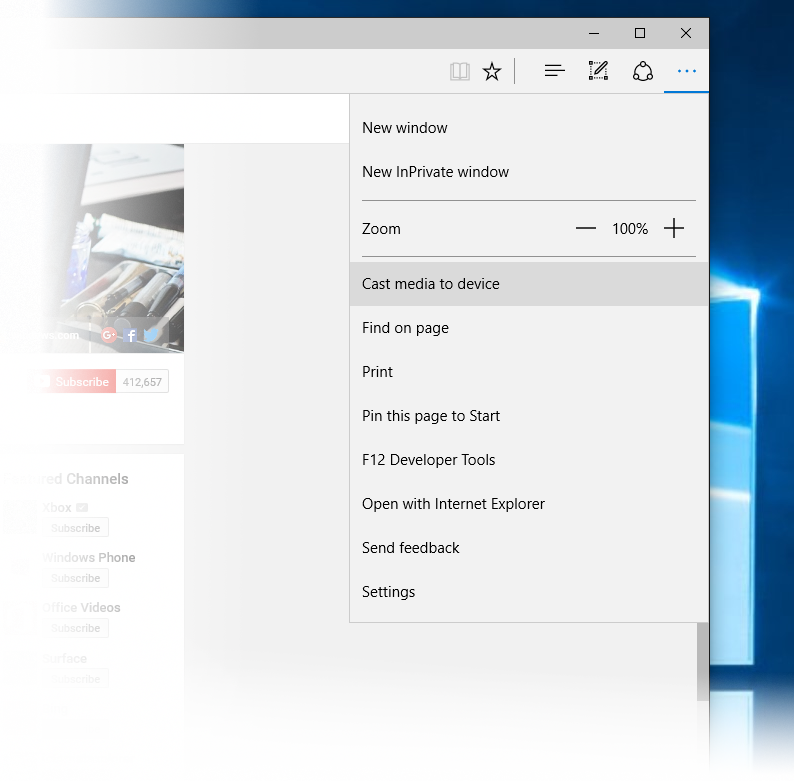 Cast your music from Pandora: Login to Pandora in Microsoft Edge to get to your music and click on the "…" menu and the top left, and select "Cast media to device" and select the Miracast or DLNA device you want to cast to. Try this feature out and let us know what you think. Please note: Casting protected content (content from places like Netflix and Hulu) is not supported. Ask Cortana inside PDFs in Microsoft Edge: You can now highlight text while reading a PDF in Microsoft Edge and right-click to “Ask Cortana” to find additional information. 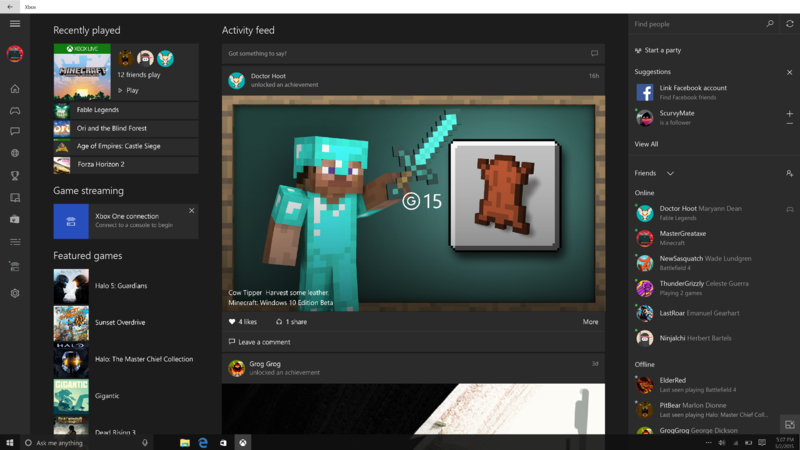 Updated Xbox beta app for Windows 10: The Xbox beta app for Windows 10 was updated last Friday which includes the ability to easily find and add Facebook friends who are also on Xbox Live to play, chat, and share clips – a top requested feature. In addition to that new feature, voiceover recording functionality has been added to Game DVR, and the Store in the Xbox beta app will allow you to search for and purchase Xbox One games – including Games with Gold and Deals with Gold promotions, and Xbox One 25-digit codes will be redeemable within the app. For more information on this update – check out this post on Xbox Wire. We fixed the issue where the Xbox app for Windows 10 would consume gigabytes of memory on your PC if you have any Win32 games (non -Windows Store games) installed on your PC that have been identified as games or added by you in the Xbox app. We introduced an early preview of nested virtualization so that people could run Hyper-V Containers in Hyper-V virtual machines with Build 10565. This build includes performance improvements. We’ve been addressing a lot of feedback around localization text UI in various languages and you’ll see a lot of that work in this build. The search box should now work in this build if you are in a locale where Cortana is not available. After upgrading to this build, all your Skype messages and contacts are gone in the Messaging app. The workaround for this is to navigate to C:\Users\<USERNAME>\AppData\Local\Packages\Microsoft.Messaging_8wekyb3d8bbwe\LocalCache in File Explorer and either delete or rename the “PrivateTransportId” file. Then restart the Messaging app. Additionally, you can install the app from the Store as an updated app. We hope you get a chance to try out these new features and let us know what you think. As always, send us problem reports and suggestions using the Windows Feedback app.